There are hundreds of varieties of Tomatoes. And, although they were originally thought to be poisonous by Europeans, they are now considered almost a health food as a good source of antioxidants. They have also been linked to heart health. The tomato is native to South and Central America. 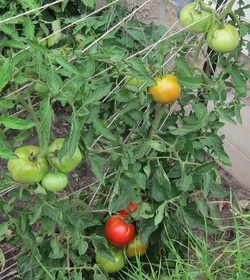 Europeans were introduced to the tomato when Cortez brought seeds back from Montezuma's gardens around 1520. However, at that time the Europeans grew them only as ornamental plants, not food. The Spanish and Italians eventually began eating them and their popularity spread throughout Europe. Thomas Jefferson was introduced to the tomato in France and sent some seeds back to America. Their popularity was forever settled when Joseph Campbell introduced condensed tomato soup in 1897. A staple of Italian cooking, recipes including tomatoes are endless. Here are a few favorites. I found this recipe among some my mother saved from newspapers in the 1950s. I couldn't imagine a pie with tomatoes...it sounded disgusting! But I had to try it and discovered it was delicious. My family loves this recipe. Pre-bake the bottom crust for 5-8 minutes at 450°. Reduce oven temperature to 350°. Layer tomatoes, herbs, onions and cheese evenly in pie shell. Mix mayonnaise, lemon juice, salt and pepper and spread on top. Cover with second crust. Crimp edges and cut slits for steam. Bake until the top is golden, about 45-50 minutes. Let stand 10-15 minutes before cutting. Place bread in a 15 x 10 inch baking pan in a single layer, cutting to fit, if necessary. is against the pan. Arrange bacon over bread; sprinkle with 1¾ cups of the cheese; set aside. 15 minutes. Arrange reserved tomato slices over the top. Bake until set, about 8 minutes. simmer one hour, stirring occasionally. ​Since it’s usually warm when tomatoes are in season, I tend to use the frozen ones from the freezer in the dead of winter when I need comfort foods and soups to warm me up. Thaw the tomatoes. Coarsely chop the onion and garlic. Blend the tomatoes, onion and garlic in a blender about 1/3 at a time. Set aside. Melt the butter. Whisk in flour. When the flour is absorbed by the butter, add the milk and cook until smooth and thick. Remove from heat and stir in pureed tomatoes, onions and garlic. Add salt, cayenne pepper and oregano. Mix well and continue to stir until it is heated through. Add basil and cooked another two minutes or so. Note: This is pretty flavorful. You might want to start with only 1/8 tsp of cayenne and see if that is enough for you.